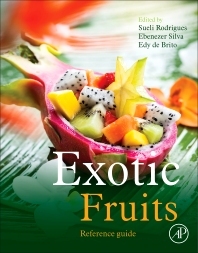 Exotic Fruits Reference Guide is the ultimate, most complete reference work on exotic fruits from around the world. The book focuses on exotic fruit origin, botanical aspects, cultivation and harvest, physiology and biochemistry, chemical composition and nutritional value, including phenolics and antioxidant compounds. This guide is in four-color and contains images of the fruits, in addition to their regional names and geographical locations. Harvest and post-harvest conservation, as well as the potential for industrialization, are also presented as a way of stimulating interest in consumption and large scale production. Graduate at Chemical Engineering from Universidade Estadual de Campinas (1998), Master's at Chemical Engineering from Universidade Estadual de Campinas (2000) and PhD. at Chemical Engineering from Universidade Estadual de Campinas (2003). Graduate at Agronomy (Agronomic Engineering) from Federal University of Viçosa (1991), Master's at Crop Science from Federal University of Viçosa (1994), Ph.D. at Plant Physiology from Federal University of Viçosa (2000) and Senior Internship at University of Massachusetts – Amherst (2010). Graduate at Industrial Chemistry by Universidade Federal de Sergipe (1989), master's at Ciência e Tecnologia de Alimentos by Universidade Federal da Paraíba (1993) , Ph.D. at Tecnologia de Alimentos by Universidade Estadual de Campinas (2000) and Postdoctorate by the United States Department of Agriculture (2006) . Currently is of Embrapa’s Tropical Agroindustry. Information on a diversity of fruit that are not traditionally exploited on worldwide basis. For the price I found it lacking; not only fruit vareities but also pictures. Disappointed at lack of tropical fruits included in general.